Hi folks. This is a video I recorded in the bleak hours of Tuesday morning (file too huge on 60D even reduced to 720p to upload in time :S). 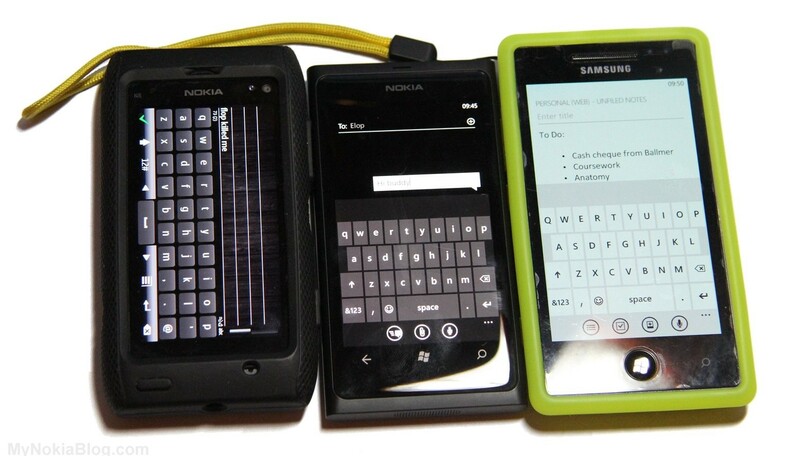 It was a repeat of a test I did at Nokia World between the Nokia Lumia and the Nokia N8 keyboard. I seem to have lost that video but the test result is identical. The keyboard on Windows Phone (even vanilla, not NoDo or Mango) was a breath of fresh air. First, simply, the keyboard is multitouch. If you type fast, you end up overlapping input. If there’s no multitouch keyboard, the words immediately gets messed up. Keyboard is very accurate. It can predict what letters will be used and make the areas around the most likely next letters larger (not visibly, just where you tap) so your input is more accurate. Without this, you’re more likely to mispress a letter, particularly if moving onto a smaller portrait display. The autocorrect is superb. Even with typos, you can leave most in and it will autocorrect them. It may have a problem with your own self-made abbreviations, like if I say, “tomo” it will correct it to Toni. If always typing complete words (in English is all I’ve tested) it’s amazing. The keyboard sounds are very helpful. You can turn them off but in your first week, keep them on. Different groups of keys have different sounds. The 1)letters; 2) backspace, enter, shift, characters; 3) space bar. This helps give an extra sense if you’re pressing the right set of letters. It reinforces the placements of certain groups of keys and that really assists in learning/using the keyboard. I keep it on when I’m typing really fast, I want to know it’s registering all my presses. The keyboard is contextual and switches back from character view intuitively. Sometimes you might see @/.com depending on the field (if you’re in browser or area where you need to put email). The character view is smart too. It knows when you’d most likely just need only one of that character and switch back. e.g. ‘ or @. Also when you press spacebar, it will change back to letters view. In contrast, the default keyboard in N8 was terrible. No multitouch, poor autocorrect, nigh on impossible to use in portrait (hence possibly why they stuck with T9 for a long time). It was the most frustrating thing to have to type on the N8 again. Just using the N8 on its own, I thought was fine. I just never expected when moving to WP that I’d get along with the keyboard so well and could type relatively very fast on it. I’ve used iOS keyboards – known for having possibly one of the best – but still found myself at times getting mistakes. With this WP keyboard (as well as the other issues I mentioned that this did brilliantly) I found it slightly harder to use my N8 as my main phone except for photo taking, and much easier to transition into WP. The keyboard is genuinely fantastic. I was looking forward to answering messages on a touch screen keyboard. I have written out essays, reviews and taken lecture notes typing on this keyboard. I’m really happy to see it on a Nokia. It wasn’t just a random switch to WP because we were a “paid Microsoft shill”, I did actually like using it. Here’s one of those things. The only surprise that came to me was how good the keyboard apparently is in the Nokia N9 (I have not tried it long enough to say so, but one person in particular, ex Engadget-now-TheVergeVlad, was praising it to high heaven. Either way, both phones have a fantastic keyboard (no not N8. Use swype).